If you’ve seen the 1992 Disney animated film, Aladdin, one of the characters in that movie that you would probably never forget for the rest of your life is Jafar’s (جعفر) pet parrot and sidekick, Iago (ياغو). Iago, who was voiced by none other than American actor Gilbert Gottfried, has given video games a whole new twist by voicing classic video games! This was received greatly by fans and gamers as the Youtube video has raked in more than 78,000 views in the five days after it was uploaded in the Game Informer. The clip, entitled as Gilbert Gottfried Voices Our Favorite Games, runs for almost 3 minutes and it shows Gottfried in that famous voice of his providing the game lines for The Legend of Zelda: Ocarina of Time (ゼルダの伝説 時のオカリナ), Resident Evil (バイオハザード) and Metal Gear Solid (メタルギアソリッド) just to name a few. Can you even picture out Iago saying those things? Gilbert Gottfried was born in February 28, 1955 and began his career as a stand-up comedian at the age of 15 in New York City. His voice acting career took to great heights after providing the voice for Iago. 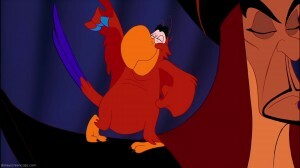 Since then, he has been referred to as the Iago Guy on more than one occassion. One of Gottfried’s famous voice acting clips is the NSFW reading of Fifty Shades of Grey. Ready to crack up a laugh? Then stop reading and start watching the video. We linked it below for your viewing pleasure. Tell us which your favorite Gilbert Gottfried video game line one the comments section!